Jurassic World: Fallen Kingdom finally takes the story of Jurassic Park to a place it’s been poised to enter since before the original park was even set to open – the black market. Yes, back in 1993, Dennis Nedry was hired by outside sources to steal the dinosaur DNA that InGen had been working on, and his trying to do so is what lead to the first dino-catastophe on the island. The DNA never did get out, and Jurassic Park never officially opened. Flash-forward to 2015 and Jurassic World is a flourishing theme park, that eventually plays with gene splicing, creating a genetically modified hybrid dinosaur called the Indominus Rex, who goes on a killing spree and causes the park to be closed once and for all. 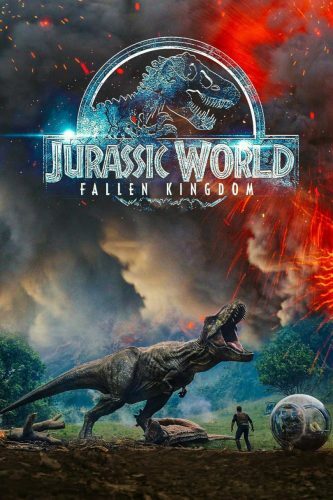 Now, while Fallen Kingdom starts off with a team heading back to Isla Nublar once again, this film treads into some new territory for the franchise with the long-warned fear of dinosaurs being viewed as potential weapons of war finally coming to fruition. This does slow the story down a bit in places, as it’s not just a movie about people trying to avoid being eaten while trying to get to safety (though there’s still plenty of that); but it’s not slowed to the point of being boring – it’s just a somewhat different type of pacing and storytelling than the franchise has used before which may not sit well with everyone. Fallen Kingdom picks up three years after Jurassic World, with Jurassic World’s former Operations Manager, Claire Dearing (Bryce Dallas Howard), having created a Dinosaur Protection Group. This group aims to build support in the U.S. Senate so that the dinosaurs who remain on Isla Nublar can be rescued from an extinction-level volcanic event that’s set to decimate the island. Unfortunately, the senate chooses to let this act of God run its course, leaving the dinosaurs to fend for themselves and, well, be killed off. A little side note for those wondering about Isla Sorna, or Site B, which was the focal point of Jurassic Park: The Lost World and Jurassic Park III, it’s said that the dinosaurs were moved from that island to be part of Jurassic World while the park was still up and running. This is a bit of a stretch of the imagination, considering just how many dinosaurs were on Isla Sorna, but while life does find a way, it also ends, so it’s entirely plausible that some just didn’t make it. Plus, it does keep things focused on just one island, which helps tidy things up a bit from a storytelling perspective, even if there could’ve been a bit more explanation towards it. So, with the dinosaurs being left to their own devices, Claire is contacted by Benjamin Lockwood (James Cromwell), John Hammond’s former partner in creating cloned dinosaurs, who tells her he’s got a solution that will make up for both of their past sins – a new island sanctuary for the dinosaurs to be free once and for all, with no fences or monitoring systems. The catch is that they have to get the dinosaurs off the island before it’s destroyed. Lockwood’s aide, Eli Mills (Rafe Spail), tells Claire he’s put together a team to go rescue the dinosaurs, but he needs her to contact Owen Grady (Chris Pratt) to help contain the lone remaining Velociraptor, Blue. With the band back together on the island, Director J.A. Bayona really nails the atmospheric mood of impending doom, while also keeping the suspense and emotional stakes high and the action fluid and fresh throughout in what could’ve easily ended up being just another walk in the park. This is also where we kick into what’s arguably the most explosively entertaining and visually stunning action sequence in Jurassic Park history. Yes, returning to Isla Nublar one final time definitely sends the island out with a bang. The destruction of the island isn’t a spoiler, as its fiery fate was actually used as most of the advertisements to market the film. But it’s because of the end of this theme park era that this series is so wildly known for that the franchise can finally start to head in a new direction. That direction is, as mentioned above, selling these rescued dinosaurs on the black market. Now after such an intense end to the first act, the story can’t help but slow down a bit. I didn’t mind it at all, as I felt it gave a slower burn to the second act, constantly raising the stakes while also delivering bursts of action when needed. Some may not like this change of pacing, but again, this is a different story than we’re used to. Not everything is simply about dinosaurs running rampant and people screaming in fear. In fact, the tone of this movie is much darker than previous outings. While there are still plenty of jokes to be had, the story itself is filled with moral quandaries, and a lot more ruthless villainy than we’ve seen before. Often the antagonists of this franchise are the carnivorous dinosaurs, such as the T-Rex, velociraptors, Spinosaurus, or the Indominus Rex. Sure, there’s often a minor human baddie thrown in that we can’t wait to see get eaten, but it tends to boil down to heroes Vs. dinosaur. This time out, however, the scale tips in the direction of the evil humans, as there are just a lot more of them to go around that really, really deserve to get theirs. And that’s something else that Fallen Kingdom does really well, in that it uses its time to set up the main villains properly, establish their goals, and really make you despise them as people. The same can’t be said, however, when it comes to the new characters on Team Save the Dinosaurs, with only paleo-veterinarian Zia Rodriguez (Daniella Pineda) standing out as memorable and someone to root for their survival – unlike IT guy, Franklin Webb (Justice Smith.) Now, I understand he’s there to add a bit of comic relief as the nerdy computer guy who doesn’t belong in this action-hero environment, but he often just comes off as annoying, constantly spewing out redundant lines focused on his fear of the T-Rex showing up. This goes on to the point where you just wish he’d get eaten so you could stop listening to him worrying about it. While humans do make up the most malicious creatures of the film, much like the reasoning behind the creation of the Indominus Rex in Jurassic World – with audiences clamoring for something bigger and badder to keep their attention – Fallen Kingdom has its own new deadly dino-foe that should satisfy those eager to see some classic bone-crunching action. Notable Cast: Chris Pratt, Bryce Dallas Howard, Rafe Spall, Justice Smith, Daniella Rodriguez, James Cromwell, Toby Jones, Isabella Sermon.